If you are a big fan of going hiking or biking, then the Daiquirí should be your hotel while in Cayo Guillermo, due do their special, popular tours. 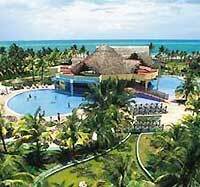 Apart from that, Daiquirí is a 4 star All-Inclusive luxury hotel, ideal for those seeking a relaxing holiday in Cuba beside the Caribbean sea, right in front of the world’s second largest coral reef, which is highly attractive for those keen into diving. In this regard, guests of the Daiquirí can practice not just diving, but other water sports such as snorkeling and kitesurfing. Besides, the Daiquiri offers a full program of games and activities for children and teenagers, while adults can relax at the spa or enjoy the hotel's facilities and the beach of fine sand and turquoise waters. The pools, tennis courts, sauna and massage salon are definitely among the resort’s most celebrated services. As for gastronomy, the hotel’s buffet offers good quality and delicious Cuban recipes, as well as international cuisine. Besides, there are other three a la carte restaurants: Mexican, Italian and Cuban traditional, which, for sure, will become the delight of fine cuisine lovers. Rooms are spacious, comfortable and very practical, as well as elegantly decorated. They all include satellite TV, telephone, ensuite bath, hot and cold water, safe and minibar.